Hubby had a birthday recently, and we gave our traditional combo Super Bowl/birthday party for him, complete with a crowd in our apartment that involved the purchase of some folding chairs. Now, when he and I give a party, we don’t mess around. We both come from a long line of enthusiastic hosts who serve so much food they are inevitable stuck in the kitchen most of the party–good thing our kitchen is partially open to the living room so we can join in the fun! The Brown Butter Apple Pie was based on this prize-winning recipe from Leigh Loper. I bought a gorgeous array of apples from the Union Square Greenmarket, and did almost exactly as she instructed–except that I added quite a bit of ginger to the spice mix and, as I always do with homemade pies, I substituted my Grandma’s pie crust recipe. I doubled the crust recipe and did the top crust with overlapped star cookie cutter cut-outs–that’s a new one for me, and it was so cute and easy that I will definitely do it again. Much more forgiving than a lattice crust! The pie baked beautifully and the filling was incredible–I find some apple pies a bit bland and gummy, but this had a lovely balanced spice, an incredible richness from the browned butter in the sauce, and the level of thickening was just right for my taste. It will absolutely be my go to apple pie recipe from now on. Prepare the Margarita Simple Syrup: In a small saucepan, combine sugar, water and citrus juices. Cook over medium-high heat, stirring constantly, until sugar dissolves completely and mixture comes to a boil. Remove pan from heat; stir in tequila and liqueurs. Allow to cool to room temperature–do this while the cake is baking, because you want the cake layers to be slightly warm still in order to best absorb the liquid. *Spoiler alert: Holy crap, this simple syrup is DELICIOUS. It may need to be modified into a homemade margarita mix of sorts in the future. The bit of blue curaçao combined with the citrus juices gave it a faint minty-green hue. Quite pretty! Then, I iced the cake with Stacy’s cream cheese frosting, adding some lime and lemon juice and more tequila and blue curaçao to her original recipe. The additional liquid made the frosting a bit runny, so I added extra powdered sugar and it thickened it up pretty well. It had a lovely citrus-y flavor with a faint hint of booze, but next time, I might be even more daring with the tequila in the simple syrup and frosting. 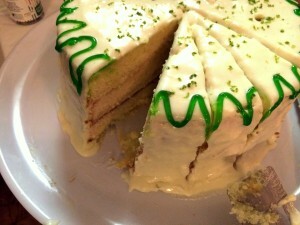 A bit of lime zest on top and a swirl of green decorative icing, and she was ready for company. This cake may have to come out for Cinco de Mayo! Hubby's birthday party came off beautifully–and thank goodness we had enough guests to not leave too many delicious fried leftovers for me to nosh on for the rest of the week. That said, I may have had apple pie for breakfast the next day. Believe me, if it was in your fridge, you would have too . . .